This post was originally meant to be published on October 8, 2013, but due to the federal government shutdown was delayed until now. 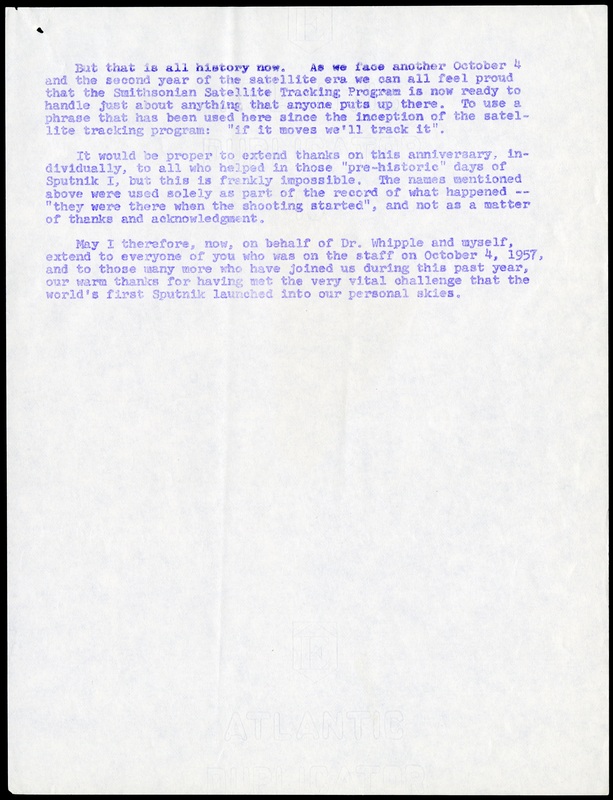 October 3, 1958 Memorandum from J. Allen Hynek to Satellite Tracking Program Staff on the first anniversary of Sputnik, page 1. Accesion 04-138 - Fred Lawrence Whipple Papers, Smithsonian Institution. Neg. no. SIA2013-11038. 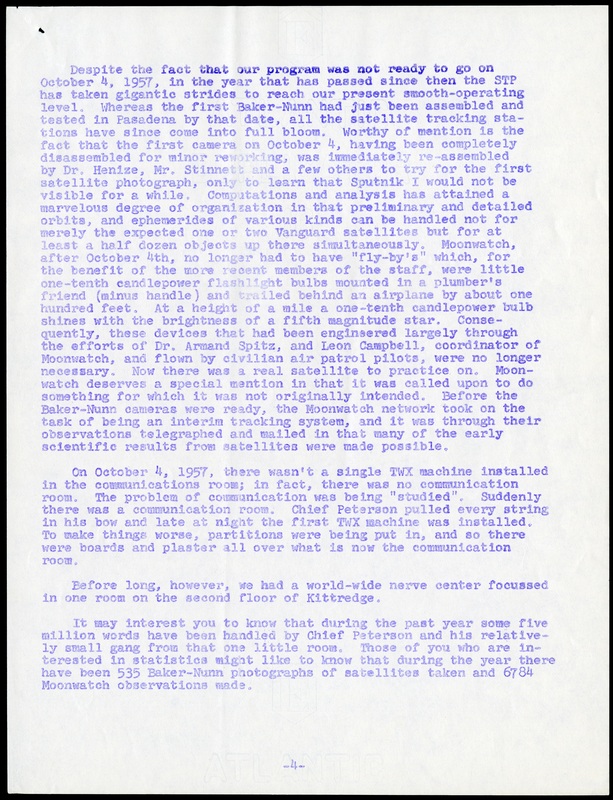 October 3, 1958 Memorandum from J. Allen Hynek to Satellite Tracking Program Staff on the first anniversary of Sputnik, page 2. Accesion 04-138 - Fred Lawrence Whipple Papers, Smithsonian Institution. Neg. no. SIA2013-11039. 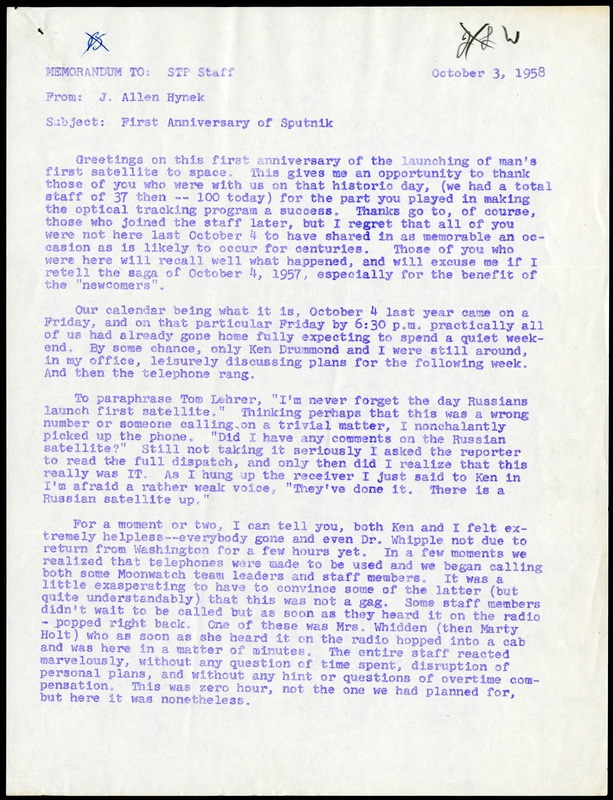 October 3, 1958 Memorandum from J. Allen Hynek to Satellite Tracking Program Staff on the first anniversary of Sputnik, page 3. Accesion 04-138 - Fred Lawrence Whipple Papers, Smithsonian Institution. Neg. no. SIA2013-11040. 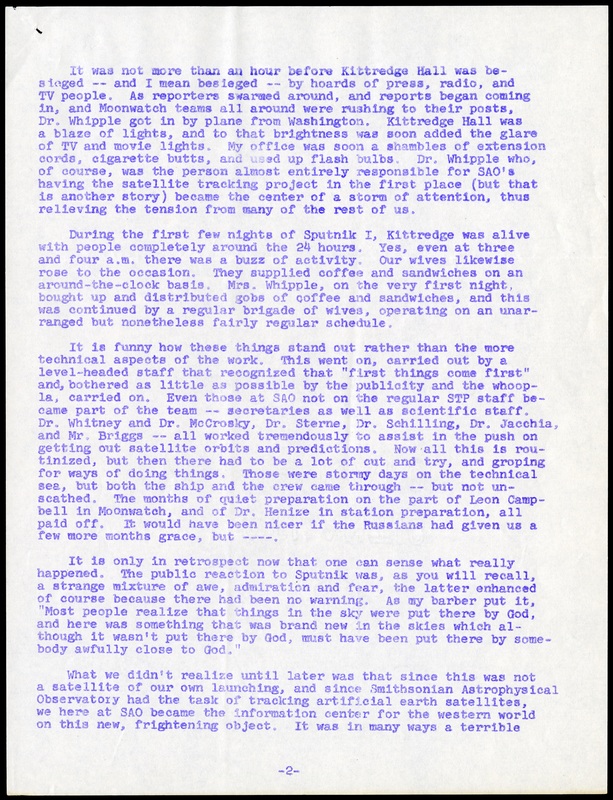 October 3, 1958 Memorandum from J. Allen Hynek to Satellite Tracking Program Staff on the first anniversary of Sputnik, page 4. Accesion 04-138 - Fred Lawrence Whipple Papers, Smithsonian Institution. Neg. no. SIA2013-11041. 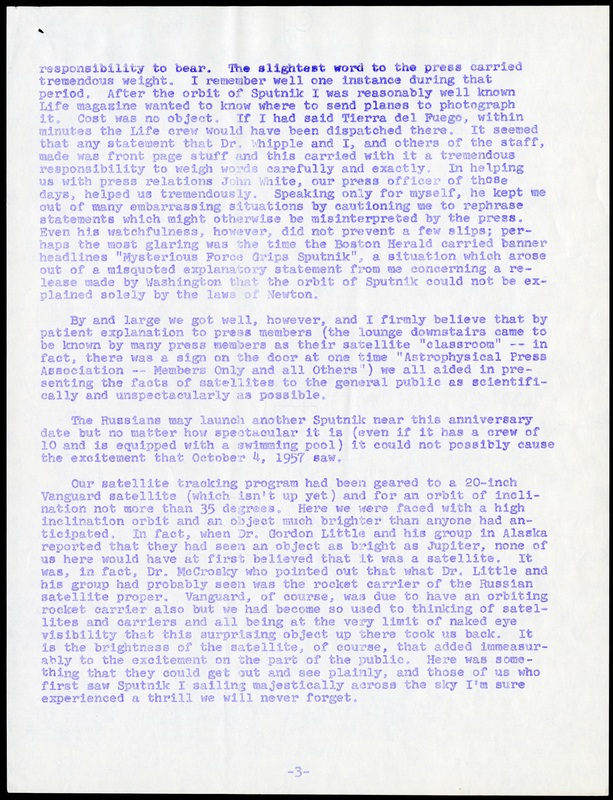 October 3, 1958 Memorandum from J. Allen Hynek to Satellite Tracking Program Staff on the first anniversary of Sputnik, page 5. Accesion 04-138 - Fred Lawrence Whipple Papers, Smithsonian Institution. Neg. no. SIA2013-11042. 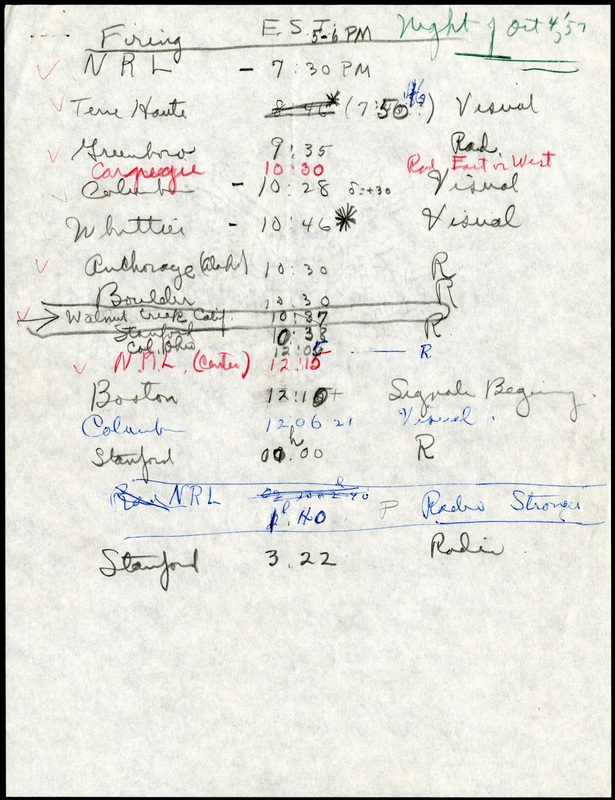 Notes listing reports from U.S. Moonwatch stations, October 4, 1957. Accesion 04-138 - Fred Lawrence Whipple Papers, Smithsonian Institution. Neg. no. SIA2013-11044. Moonwatch Volunteers, 1965. Record Unit 371 - Office of Public Affairs, The Torch, 1955-1960, 1965-1988, Smithsonian Institution Archives. Neg. no. 96-960. On October 4, 1957, the Soviet Union launched the world's first artificial satellite, Sputnik I. The event caught many by surprise, and it marked the beginning of the U.S.-U.S.S.R. space race. At the Smithsonian Astrophysical Observatory (SAO) in Cambridge, Massachusetts, there was certainly surprise when news of Sputnik broke, but SAO had placed in motion a structure ready-made to track the satellite and became the epicenter for Sputnik information in the western world. 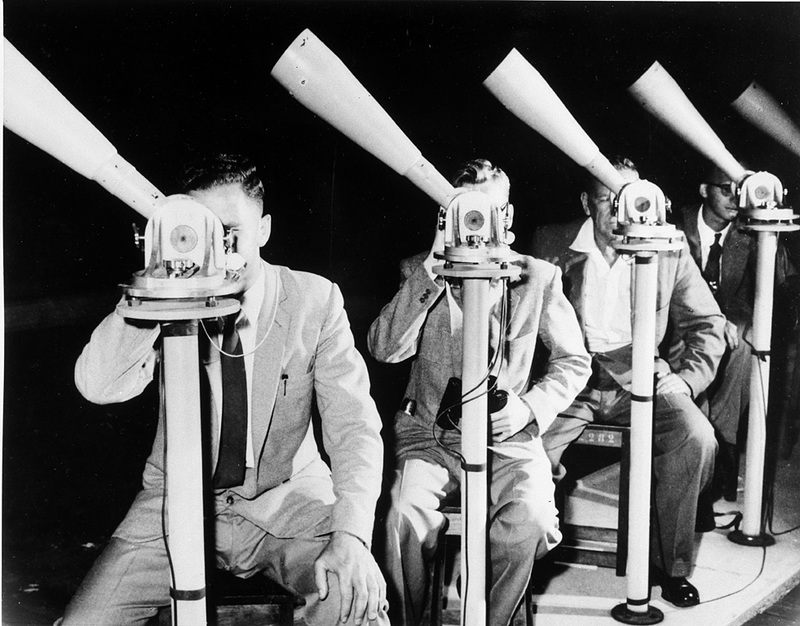 In 1956, SAO established the Satellite Tracking Program Moonwatch Division to track and photograph the artificial earth satellites to be launched during the International Geophysical Year, 1957-1958; more specifically "Operation Moonwatch" was created to track the path of a satellite to be launched by the United States. For a moment or two, I can tell you, both Ken [Drummond] and I felt extremely helpless--everybody gone and even Dr. Whipple [SAO Director] not due to return from Washington for a few hours yet. In a few moments we realized that the telephones were made to be used and we began calling both some Moonwatch team leaders and staff members. It was a little exasperating to have to convince some of the latter (but quite understandably) that this was not a gag. Some staff members didn't wait to be called, but as soon as they heard it on the radio - popped right back. Those were stormy days on the technical sea, but both the ship and the crew came through--but not unscathed. The months of quiet preparation on the part of Leon Campbell in Moonwatch, and of Dr. Henize in station preparation, all paid off. It would have been nicer if the Russians had given us a few more months grace, but----. The Satellite Tracking Program was "not ready to go" on October 4, 1957, but it was kicked into high gear rather quickly. Sputnik wasn't a U.S. satellite, but SAO was tasked with tracking artificial earth satellites, and the program became the "information center for the western world on this new, frightening object." Operation Moonwatch remained active until 1975. With more than 100 teams worldwide, volunteers used the "fence method" of observing the sky. Each observer covered a small, overlapping portion of a specific sky quadrant, and watched for the passage of satellites with telescopes. The instrument used was the Moonwatch Apogee Scope, a 20 power telescope with a 5-inch objective lens. The Moonwatch teams backed up an optical network of 12 Baker-Nunn tracking cameras.